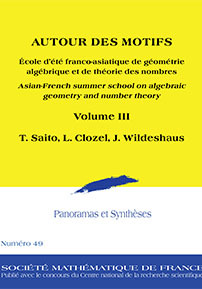 This volume contains the third part of the lecture notes of the Asian–French Summer School on Algebraic Geometry and Number Theory, which was held at the Institut des Hautes Études Scientifiques (Bures-sur-Yvette) and the Université Paris-Sud XI (Orsay) in July 2006. This summer school was devoted to the theory of motives and its recent developments and to related topics, notably Shimura varieties and automorphic representations. A publication of the Société Mathématique de France, Marseilles (SMF), distributed by the AMS in the U.S., Canada, and Mexico. Orders from other countries should be sent to the SMF. Members of the SMF receive a 30&percnt; discount from list. Graduate, postgraduate students, and research mathematicians interested in Artin–Tate motives.